A majority of the top 200 government contractors made more money on federal awards last year than in 2011, despite major budgetary cutbacks, according to a report released Wednesday. Overall, the federal government spent $516.3 billion on contracts in fiscal 2012, down 3.1 percent from fiscal 2011’s total of $532.6 billion, the largest year-over-year decline in inflation-adjusted dollars since 1997, the analysis said. Sixty-four percent of that total went to the top 200 companies doing business with the government. Bloomberg Government, which published the report, analyzed data from 24 agencies and departments, and in 20 categories of federal purchases. Bloomberg found that many contractors were able to maintain or increase business by focusing on sectors that were not subject to “budget pressures,” such as space vehicles, drones, health information technology and cybersecurity. 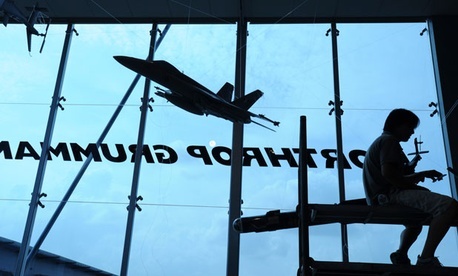 Defense contractors topped the list, with Lockheed Martin, Boeing, General Dynamics, Raytheon and Northrop Grumman comprising the top five in the government revenue rankings. Those companies earned $109.6 billion from Uncle Sam in 2012, accounting for one-third of all the money spent on the top 200 contractors, the report said. At Defense, only the Air Force increased its contract spending from 2011. Overall, Pentagon contract expenditures were down 3.7 percent -- but still made up more than two-thirds of all the government’s private-sector spending measured in the report. The Defense Department continued its downward trend in April, with a 52 percent decrease in contract spending from the previous month, the report said. The Education Department saw the biggest spike in contractor spending, doling out $2.1 billion in 2012, a nearly 31 percent increase from 2011. Most of the increase went to student loan servicers, according to Bloomberg. The Transportation Department and U.S. Agency for International Development also increased business with the private sector by more than 15 percent. The General Services Administration oversaw the biggest drop in contract spending in 2012, with a year-over-year decline of nearly 23 percent. Thirty-seven companies were new to Bloomberg’s top 200 list, a quarter of which were oil companies. One-third of the companies that jumped 25 or more spots in the rankings were also oil companies. Several additions to the list resulted from a larger company restructuring through spinoffs to focus solely on government business. Several additions to the list resulted from a larger company restructuring through spinoffs to focus solely on government business.